Several attendees of this year's Creating Change conference aimed to remind others of the racial rifts that must be mended. Racial justice took center stage throughout the National LGBTQ Task Force's annual convening of activists and leaders, as many mourned and rallied over the deaths of people of color who have died in the last year due to anti-LGBT violence or police killings. 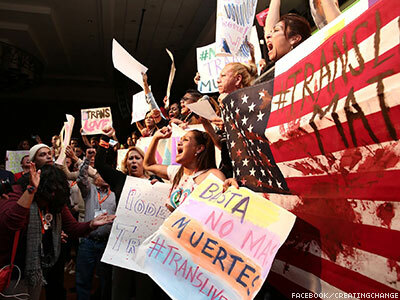 Following the day-long racial justice institute on Wednesday, a group of transgender activists took the stage Thursday night, demanding solidarity from LGBQ advocates with the message #TransLivesMatter. The group's message was tied to the recent death of Jessie Hernandez, a 17-year-old queer Latina who was fatally shot by police in Denver in a car authorities report was stolen. Hernandez and four other teenagers in the car were unarmed, and witnesses contend that the police fired first, killing the teen and causing her to lose control of the car, which struck and pinned an officer's leg between the vehicle and a wall. The officer was treated for a broken leg and released from the hospital later that day. Both officers involved have been placed on administrative leave, which is standard protocol for officer-involved shootings. Hernandez's death marked the fourth time in seven months that Denver police have fired into a vehicle, claiming the car was being used as a deadly weapon. Thursday evening continued with a scheduled discussion between Color of Change executive director Rashad Robinson and Race Forward executive director Rinku Sen on police brutality and the racially charged actions that followed the death of 18-year-old Michael Brown in Ferguson, Mo. "We have a history of violence by oppression — they shoot you — or violence by neglect," Sen said. Robinson implored LGBTQ attendees not to "ignore this moment." He added, "There was more that white progressive movements could have done in this moment. … In this country we have a mass incarceration that is killing a whole generation of black and brown people." As Patrisse Cullors, Opal Tometi, and Alicia Garza, the three creators of #BlackLivesMatter, accepted the Empress I Jose Sarria Award for uncommon leadership, the trio seized the moment. "We had a whole speech planned, but now is not the time for speeches — it's the time for action," they said. Instead, they read the names of three transgender women who were killed this year in the United States, which was followed by three minutes of silence. Calls to include the voices of activists on the ground in Ferguson — who were attending the Creating Change conference but not part of that evening's plans — were later addressed. A group of activists were invited on stage to speak to the crowd the next day before Task Force executive director Rea Carey's annual state of the movement speech. The group included Fergson organizers and activists Alexis Templeton and Brittany Ferrell, cochairs of Millennial Activists United, with Daunasia Yancey, Mel Braman, Keith Rose, Eli Chi, and several others. Activist Ashley Yates used her time to invite black transgender people up to the stage. The group told the audience about the harsh realities they face as LGBTQ people of color, and the unmatched need for white allies in the #BlackLivesMatter movement. After the activists turned the stage over to Carey, she emotionally urged everyone in attendance to address racial and gender equality in their work. She later told The Advocate that time was allotted to the activists to share what they have experienced on the ground to the Creating Change audience. "We wanted to have organizers from Ferguson be able to talk about their work and talk about organizing, and talk about what they see, and what they want," Carey said Friday. "I'm glad that we did that, and that they were able to be there on the stage and invite others." The following day, Yates, Rose, Templeton, Ferrell, and Ashton Rome led a discussion of LGBTQ involvement in Ferguson. Two of the activists on the panel were originally from the greater St. Louis area, but all of them reported feeling a need to travel to Ferguson in the wake of Brown's death. "Mike Brown saved my life," Templeton said. "I was able to put my struggle in this bullhorn." Activists addressed a response to the #BlackLivesMatter movement, which attempts to "water down" the message by proclaiming that #AllLivesMatter. The panelists were united in rejecting the response. "When I start seeing white people laying on the ground for four hours, then maybe I'll say 'All Lives Matter,'" said Templeton, referring to the fact that Brown's body was left in the street for four hours after he was shot as police claimed to be investigating. Rome, an organizer with the LGBT and antiracist political group Socialist Alternative St. Louis, summarized the message that many of the organizers in attendance at Creating Change tried to convey to all of the attendees: "The struggle for black liberation is the struggle for LGBTQ liberation." In embodiment of that idea, the Ferguson activists had planned to lead a march to the Denver Police Department headquarters, where they would not only proclaim that Black Lives Matter, but demand justice for Jessie Hernandez, the unarmed 17-year-old gay Latina who was killed by Denver police last month. Hernandez's family members had been present during the conference but were not at Saturday's event because they were hosting the teenager's funeral. The family has called for a federal investigation into the shooting, particularly after Hernandez's mother told media that her daughter was shot 18 times. The family had initially approved of the planned protest, but contacted local youth organizers on Saturday morning, and asked the demonstrators to take no action, reserving the day for mourning.